I’ve updated the mock draft for the final time this year. There’s just four months left until the next NFL draft and we’re starting to get a clearer picture as to how things may shape up. To see the latest projection click here or select ‘mock draft’ from the title bar. Remember – the deadline for underclassmen to declare is January 15th. As the bowl games come to an end we should start to find out which of the high profile draft prospects will turn pro. It should be an interesting fortnight. I suspect nearly all of the top-underclassmen will declare. While the threat of a lock-out remains a real danger in 2011 – April’s draft is secure as the final event in the current CBA (collective bargaining agreement). Whenever a new CBA is agreed it will almost certainly contain a rookie salary cap, ending the ever increasing fortune earned by the top prospects. Because the first overall pick can agree a contract at any point leading up to the draft, it’ll make it almost impossible to install a rookie cap to include the 2011 class. At the moment there is only doubt as to whether the big money will remain – by 2012 that doubt will be completely removed with a new CBA. Money talks – and this could be the last chance to earn a big pay-day. In my latest projection I have five quarterbacks being drafted in the first thirteen picks. This would be clearly be an unprecedented occurrence. However, it’s also rare to see as many QB’s with such a high grade. Andrew Luck, Cam Newton and Blaine Gabbert are all worthy of top-ten consideration. I consider Ryan Mallettvery much a top-15/20 talent with only some concern’s about his personality and work ethic causing some resistance. I would grade Jake Locker in the late first or early second round region – but understand why there’s every possibility he will be drafted amongst the top-15 picks. At the moment, there are a number of teams where the quarterback position is clearly the biggest need. As we move towards free agency this situation should become clearer. When Washington traded for Donovan McNabb last year, it was considered less likely that they would draft a QB. If, for example, a team like Arizona were to approach Denver regarding Kyle Orton (a smart move in my opinion) – suddenly they have solved their biggest need. If Arizona don’t find a QB before the draft, you would have to believe they are going to take one. Right now, it’s hard to look at teams needing a QB and placing them with a different prospect. I’m not totally convinced five quarterbacks go in the top-13 as expressed here – but I certainly wouldn’t rule it out at this early stage. This was a strange game to watch – basically one team played like their lives depended on a victory (Washington) and the other like there was a beach somewhere with their name on it. The main focus was on Jake Locker (QB, Washington) to see if he could improve from a disastrous performance when the two teams met earlier this year. Statistically, there wasn’t a major improvement (5/16, 56 yards). Look behind the stats though and you’d realise this was absolutely a much better performance from the Huskies QB in his college football finale. For starters, he didn’t force anything and he made much better decisions. There were no deep throws down the middle into double coverage or reckless attempts with a desperation to make things happen. Locker was cool, collected and managed the game very well. When a throw wasn’t on – he lobbed it into the stands. He took what was offered by the defense, including a number of smart plays on the ground (83 yards, one touchdown). He was hampered by more drops (something that has plagued Washington the past two years). Let’s not get carried away here – he was still methodical and grounded rather than spectacular and dominating. Clearly the Huskies defense and the excellent running of Chris Polk were responsible for a 19-7 upset victory. But there were positive signs here from Locker. We know that he has superb athletic and physical qualities – he just needs to manage them. Being capable is sometimes better than actually expressing. Against an excellent defense, he controlled his team and showed the kind of ball security scouts want to see. The teams that don’t rate Locker due to accuracy problems and a lack of development this year will not change their minds based on this performance. Those who are sold on his talents were never going to be put off by a game against a team that had already dismantled Locker’s game once. I predicted that little would change whatever happened in the Holiday Bowl. But this was an encouraging display and Locker takes momentum into a possible Senior Bowl appearance, the combine and his pro-day. I would recommend passing on the Senior Bowl where it’s notoriously difficult for quarterback’s to impress. The combine and pro-day work out will secure a high draft pick come April. Elsewhere, I was again disappointed by Prince Amukamara (CB, Nebraska). He came into the year a top ranked prospect – and people are using that to keep him high. It’s lazy, to be quite honest, because this has not been a good year for the senior. For starters – how many big plays has Amukamara made this year? Absolutely zero. He has no interceptions. Do teams avoid him? Absolutely – for the most part (although Oklahoma State didn’t when Justin Blackmon gave him a schooling). But then don’t teams avoid Patrick Peterson too? He’s found a way to make plays – against better opponents too – collecting four picks and big return yardage. Amukamara looks a little stiff to me which isn’t completely unexpected as a converted running back. He’s got good size but not elite speed and his reactions remind me a lot of Malcolm Jenkins. If you remember Jenkins – he too was a top 5/10 lock ahead of the 2009 draft. I had my suspicions due to his size and lack of recovery speed and projected him as a safety. He eventually fell into the teens and was drafted by New Orleans – where he now plays safety. I’m reminded a lot of Jenkins when I watch Amukamara. Whether he ends up at safety or not remains to be seen – but it’s time people stopped grading him based on a pre-season mark. Right now I have Patrick Peterson (LSU), Jimmy Smith (Colorado) and Janoris Jenkins (Florida) ahead of Amukamara. Brandon Harris (Miami) is up there too and I suspect will over take Amukamara after work outs. Indeed Smith is emerging as a big mover up the board. His size and speed combo may be the best available in the draft aside from Peterson. If you’re looking for another top-10 lock at cornerback, take a look at Colorado’s stud CB. Hope you all have a great New Year’s Eve, enjoy the college football today and have a great start to 2011. Tonight Washington and Nebraska face off in the Holiday Bowl. I don’t need to remind anyone what happened when the two met earlier this year. Jake Locker (QB, Washington) will get a chance to improve on a performance where he completed just four passes and was left dazzled by a defense that has made many quarterbacks look average the last two years. In my opinion – Locker can’t do that much tonight to improve or weaken his stock. A lot of scouts have made up their mind on Locker already. Some don’t even consider him the best senior prospect on Washington’s roster. Even a brilliant display tonight is unlikely to change those opinions. For some, Locker is just too inaccurate and not the kind of poised pocket passer a lot of pro-teams look for. The time has passed to change minds and one game – albeit against a quality defense – is probably too little too late. Those scouts wanted to see a continued improvement and development based on the strides Locker made as a fourth year junior under Steve Sarkisian. The improvements never materialised. Yes – Locker faced more pressure than most quarterbacks (he’s been sacked an incredible 47 times the last two seasons). When he was given time, however, he still made basic errors and poor decisions. At the same time there are some who maintain faith that Locker’s physical and athletic qualities are worth pursuing. The theory being that if he can correct his problems (and that’s a big if) he has the ceiling to become an exceptional NFL quarterback. I’ve discussed in the past how I believe both Mike Shanahan and Pete Carroll would welcome the opportunity to draft Locker – and both use very similar offensive schemes. While a lot of teams will grade him in the round 2-4 range on their draft board – a team like Washington or Seattle could keep Locker amongst the top-15 picks (rightly or wrongly). I wouldn’t rule out Arizona or Minnesota either. The Huskies QB will have his admirers and if they’ve stuck with him this far – they’re unlikely to be put off by another disappointing performance against Nebraska. So I’m not sure if there’s any definite stock to be gained tonight – but of course a good performance against a quality defense will allow Locker to end his college career with momentum. The scouting combine and subsequent pro-day are tailor made for guys like Locker – he’ll have the opportunity to show off his dynamic athleticism and throw the ball without any pressure to wide open targets. While a lot of people have dropped Locker out of their mock drafts recently, by the time we get into March I suspect he’ll be firmly back amongst first round projections. Someone will draft him early. It should be an interesting game to watch and keep an eye on Jared Crick (DT, Nebraska). He’s received largely negative reviews this year despite a productive season (11 sacks). I see him as someone who could potentially play the 5-technique role for Seattle (or the Red Bryant position as it’s now known). Crick is around 290lbs and 6’5″ – big enough to set the edge while also having the ability to collapse the pocket and get into the backfield. Expect the announcers to give Prince Amukamara (CB, Nebraska) the big send up. You’ll probably not notice him much in the game as reputation has seen many QB’s avoid throwing at Amukamara. Personally, I think he’s a little over rated. He’s converted from running back and doesn’t look like a natural corner. Indeed his size and athleticism may lend itself better to the safety position. I don’t see him as a top-ten lock like most people and he could fall. I’ve just finished watching the tape from last night’s game. Overall it was a ridiculously comfortable victory for the Cowboys. My lasting impression of the game is just how over rated Nick Foles (QB, Arizona) has become. I’ve seen many high profile pundits ranking him as the #2 QB prospect if he chose to declare for next April’s draft. That’s ridiculous. Foles is just such a limited prospect with so little upside. He was picked off three times in this game, once for a long touchdown return. All three picks were careless, late throws with zero velocity. He gets nothing on his deep ball and teams will have no late night’s game planning him at the next level. He threw 50 times in this game for an average of 5.6 yards per completion. He was sacked or hit a number of times because consistently he’s so slow to make a decision. He’s not athletic enough to scramble away from pressure and he showed no desire to step up into the pocket. When a quarterback comes from such a pass-friendly, high percentage spread offense, you want to see exceptional plays or something out-of-the-ordinary to make a high grade. 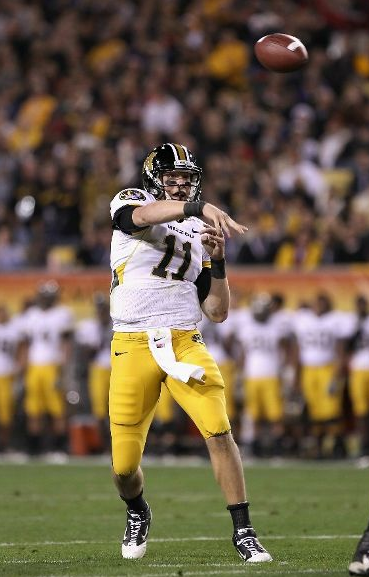 Blaine Gabbert (QB, Missouri) did exactly that despite a big error which led to defeat against Iowa in his bowl game. Foles is so limited I wouldn’t give him a grade higher than round four or five. He will return for the 2011 college season and he’s got a lot of work to do if he’s going to become a legit pro-prospect. One person who is gaining momentum is Arizona wide out Juron Criner. He’s been given a first round grade by some scouts, although it’s difficult to judge him in Arizona’s offense. With no real deep threat and a lot of high percentage short throws which don’t accommodate YAC ability, Criner was restricted to 9 catches for a mediocre 47 yards here. He did make one excellent catch for Arizona’s only touchdown – a controlled grab in the left corner of the end zone on a short, high pass from Foles. Crines flashed perfect body control and good hands to make the grab and stay in bounds. His height (6-4) was a real advantage on the play. However, he isn’t the biggest in the upper body and seems to carry more weight in his legs (listed at 210lbs). He doesn’t look the strongest. This was the second time I’ve concentrated on Criner and he was a greater threat in defeat to Stanford earlier this year. I need to further review tape of that game before I come to a conclusion on his talents. There was of course one other wide out who stood out – Biletnikoff winner Justin Blackmon. He had a typically productive game – scoring two touchdowns and registering 119 yards from nine grabs. His first touchdown was due to a coverage mistake, allowing Blackmon to be wide open deep and it was a simple pitch from QB Brandon Weeden to complete the score. I wasn’t too keen on the wide outs decision to run right along the end zone – we don’t need to see that kind of showboating. The second score was much more impressive – a low, difficult catch in coverage to the near right corner of the end zone. Blackmon showed off strong, effective hands and great body control for an impressive touchdown. Overall Blackmon is a tough receiver to project. He doesn’t have elite size (6’1″, 207lbs) and he isn’t a track-style speedster. He’s got a thick, muscular frame and he can be competitive – which is to his advantage. He’s an under-rated route runner and appears in complete control of his body. He also has the unteachable knack of getting open. Having said that, he doesn’t have the reliable hands of a Michael Crabtree (who he has been compared to) or the supreme YAC abilities of the 49ers receiver. He plays in an offense which orchestrates production and that has to be acknowledged. However – you can’t ignore a 1782 yard, 20 touchdown season. Personally, I think he’s a solid second round value receiver who can act as a complimentary #2. Having said that, teams in the 20’s who need a wide out should consider him. A logical fit could be found in Kansas City playing alongside Dwayne Bowe. The NFL regular season is one week away from completion. We will soon know how the first 20 picks will shape up for the 2011 draft. Following Minnesota’s victory over Philadelphia last night, the Seahawks would currently own the 11th overall pick. It also means Seattle can pick as high as 6th overall and as low as 32nd overall depending on upcoming results. No other team has potential for such a dramatic swing in terms of draft position. The Seahawks go into week seventeen with a 6-9 record. Victory against St. Louis on Sunday will guarantee the NFC West title and an automatic playoff spot. This would also mean (even with a one-and-done post season) Seattle would select no earlier than 21st overall. That would prove true unless the Seahawks made it to the NFC Championship where they would select 29th overall (defeated in NFC title game), 31st (defeat in the Super Bowl) or 32nd (Super Bowl winners). What if the Rams win on Sunday, putting the Seahawks at 6-10? There are six teams with a 5-10 record: Arizona, San Francisco, Dallas, Houston and Detroit and Cleveland. With the Cardinals and 49ers playing each other, one is guaranteed to finish 5-11. In defeat, this team would select before the Seahawks. The Cowboys take on the Eagles. Will Philly rest Michael Vick and other starters? Will Dallas want to end a disappointing year on a high? This could be a much closer game in the aftermath of Minnesota’s win in Philadelphia. Houston will face Jacksonville – a must win game for the Jags if they are to have any chance of winning the AFC South. They are missing QB David Garrard and RB Maurice Jones-Drew – arguably their two best players. Detroit travels to Minnesota in the midst of a three-game winning streak. Should any or all of these teams win and find themselves level with a 6-10 Seahawks outfit, it will be Seattle who selects first due to strength of schedule. Of all the teams picking in the top ten currently, only Arizona (.458) has faced a weaker schedule than Seattle (.488). Should all the teams on 5-10 win (excluding whoever loses between Arizona or San Francisco) the Seattle Seahawks will own the 6th overall pick for the second year in succession. Some fans will be split on what the best result actually is on Sunday. I imagine the majority will believe victory against the Rams (a division rival) and a playoff spot trumps any thoughts about an event that won’t happen for another four months. There will be some, however, who feel picking fifteen places higher in the draft could have a greater long term benefit. Personally, I believe it’s essential the Seahawks identify a quarterback to be a long term starter and do what it takes to bring that person to Seattle. This can be achieved via trade, but a more obvious route is through the draft. With as many as five quarterbacks with a potential first round grade for 2011 – this could be a rare opportunity. Last year – I gave one QB a first round grade (Sam Bradford). This year, there are three certainties (Luck, Newton and Gabbert) and two others (Locker, Mallett) who could easily be drafted amongst the top-15 picks. Using my most recent mock draft as an example – only Ryan Mallett (QB, Arkansas) could be left on the board at pick #21. This is all conjecture and speculation at this point, which weakens any argument for preferring draft position over victory. The deadline for underclassmen to declare isn’t until January 15th and of the names listed above – only Locker is guaranteed to be present next April as the sole Senior prospect. It’d be wrong to suggest there are no benefits to winning the division and making the playoffs. It’d also be wrong to claim there’s no way the Seahawks could manipulate their way into drafting the quarterback of their choice (or any other prospect for that matter) even if the team’s draft position warrants a greater expense by trading up. Even so, we can’t simply ignore that this is a unique situation we may never see again in the NFL. Has there ever been a team that could own a pick in the top six or 32nd overall going into week 17? Would it be akin to sweeping dust under the rug and hoping it’ll go away to think this team doesn’t need more top-ten talent after a largely disappointing season which could end with an unlikely flourish? *Strength of schedule (opponent win percentage) is in brackets. For the most part, this was a statement of intent. Not many people are talking about Blaine Gabbert as a first round prospect. That may begin to change after a largley impressive display against Iowa in the Insight Bowl, despite a 27-24 defeat. I’ll qualify from the outset that this wasn’t a faultless performance by any means. A lot of questions remain unanswered from the article I published ahead of the Insight Bowl between Gabbert’s Missouri and Iowa. The Hawkeye’s didn’t do a good enough job taking away his first read which allowed Gabbert to throw a lot of scripted passes that look good, but won’t be so easily accessible at the next level. When Iowa did get into Gabbert’s head, he tried to scramble out of trouble. He’s mobile (expressed with a solid touchdown run) but he isn’t a difference maker. On a couple of occasions he was too quick to bail on the pass only to lose yardage attempting to run. The big mistake of the night came on a pick-six with 5:32 remaining. His first read wasn’t on so he chose to run. As he struggled to find space, he changed his mind again and decided to pass. The result was an ugly mistake that led to a turnover and the game winning score. It’d be very easy to dwell on the error seeing as it essentially lost Missouri the game. It’s an issue he has to correct, but it doesn’t take away from a performance that most people were ready to compliment profusely before one big gaffe. He also took a couple of unnecessary sacks in the game – further evidence of concern that sometimes he does hold on to the ball too long and that he isn’t always the coolest under pressure. He needs to know when to just save the lost eight yards (or avoid the pick six) and lob the ball into row F.
So what about the positives? There were lots of them and these shouldn’t be over shadowed. The big arm is there for all to see and that’s never been in question. A lot of guys have a big arm and never make full use of it. Gabbert over shot a couple of passes, but overall showed unique touch for someone who owns a rocket arm. This was perfectly highlighted with 6:27 left in the third quarter when he threw a beautiful 30-yard touch pass over the middle into a zone covered by three defensive backs. Everything about the throw – the touch, the accuracy, the placement. Stunning. You could pair this with a 20-yard bomb in the first quarter on 3rd & 19. With pressure in his face, this time he stayed composed with his eyes downfield and lobbed a perfect strike to his wide out for the first down. It flashed the quick, high release, accuracy and velocity that Gabbert is capable of. A lot of prospects will trust their arm too much and it leads to mistakes. Gabbert makes a full range of throws and understands when to bring out the cannon and when he needs to tone it down. Over and over again Gabbert was able to fit the ball into windows a lot of NFL quarterbacks couldn’t. He consistently found the soft-spot between safety and cornerback. He isn’t afraid to throw down the middle and whilst there were scripted plays and underneath completions – the Tigers could make any play callwith confidence. Gabbert flashed a full repetoire of passes. Missouri pretty much abandoned their running game after going behind early. During the initial comeback Gabbert remained cool and unemotional and kept his composure despite being asked to make a number of difficult throws downfield. He was responsible for a confident comeback and managed the rest of his offense. His first turn over came off a smart tip from a cornerback, although the second interception was his fault and his only. But what do you want from a franchise QB? Accuracy? Mobility? Character? Big arm? Gabbert has all of these things. Make no mistake – this was a game that will catch every scouts eye. I cannot see anything but a positive review from the NFL draft committee, making it more likely Gabbert’s name will be added to those expected to declare for 2011. I put Gabbert at #13 in my Christmas Eve mock. Expect to see him in every other mock draft over the next few days. In my latest mock draft I had the Seahawks taking Missouri quarterback Blaine Gabbert. Tonight he and the Tigers take on Iowa in the Insight Bowl from Arizona. This is a good opportunity to watch Gabbert against a solid defense. The Hawkeye’s are ranked 11th in the country for interceptions (17 in 2010) and own a solid defensive front which includes the likes of Adrian Clayborn and Christian Ballard. Three of those seventeen picks were returned for touchdowns. Gabbert is only a junior but is already seeking advice from the draft committee. The excellent Draft Insider reports that Gabbert is weighing up his options and may be regarded as the #2 quarterback prospect by some teams behind Stanford’s Andrew Luck. A good performance tonight may make this decision a lot easier. Gabbert has the size (6-5, 240lbs) and arm to be a big-time NFL prospect. He’s not immobile and can make plays with his legs. I want to see if he can dominate a game like this, making pro-throws down field and avoiding too much underneath stuff (which Missouri’s system will almost certainly afford). Speaking of the spread-system he works within – there’s a common issue that Gabbert will have to address at the next level like most college QB’s. He’s really only being asked to make one or two reads in each play. When those guys aren’t open, some have the athleticism to set off and run. Cam Newton does a very good job of that, Gabbert will try at times tonight but is nowhere near the athlete we see at Auburn or even with Jake Locker at Washington. Can he show that ability to remain composed, step into the pocket and progress to a second or perhaps third read? How will he respond if Iowa’s defense gets in his head and confuse him with an unusual look? If they take away the first option does he panic? He’s got the size to take a hit and the mobility to move away from pressure. Will he keep his eyes downfield or will he instantly look to break off a run? At the same time, he can’t afford to hold the ball too long. Gabbert’s been sacked 21 times this year and 40 times in the last two seasons. He was sacked six times against Nebraska when not given the looks he wanted. It’s a fine balancing act, but will he acknowledge pressure, remain composed and if needed throw it away? It’ll show what kind of instincts he has which will be vital against a much more complex pro-defense at the next level. The final thing I’ll be concentrating on is footwork. Gabbert will work predominantly from shotgun formations so can he set his feet, throw off the front foot and maintain balance? There’s also the way Gabbert handles the spotlight in the public eye. He did very well against an unbeaten Oklahoma earlier this season, but struggled somewhat after that victory. Only he knows what his intentions are regarding the draft, but it may be weighing on his mind. I’d also like to find some answers as to why – despite completing just two fewer passes in 2010 – he has thrown for less than 800 yards? His average per completion is down from 8.1 to 6.6 and he’s also passed for nine fewer touchdowns. Missouri went 10-2 this year so it’s nothing that can necessarily be pinned on a poor supporting cast. These problems probably won’t be solved tonight, but it’s worth considering. Aldon Smith (DE, Missouri) has already signalled his intentions to declare for the 2011 draft – he’s currently searching for an agent. He came into the year a highly rated pro-prospect with eleven sacks as a red-shirt freshman. This year has been hampered with injury and he’s been limited to six sacks and a pick. We may still be looking at a first round prospect though and his stock drops no lower than the second round. Potential LEO rusher for Seattle at 6-5, 260lbs. Adrian Clayborn (DE, Iowa) has had a disappointing year despite high expectations. Four sacks in 2010 is down from eleven last year. He was very impressive in the Orange Bowl last year and could do his stock the world of good with a similarly dominant performance tonight. Christian Ballard (DT, Iowa) a potential 5-technique for Seattle who fits the Red Bryant mantra. Size (295lbs) and height (6-5) that the Seahawks would like in that role. Would be available after early rounds. Ricky Stanzi (QB, Iowa) late round quarterback prospect who’s known for errors. Long release not preferable. Time has passed for Seattle to draft a guy like this with no immediate return. You may have seen the mock draft I posted on Christmas Eve (click here). Draft order will change after the teams scheduled to pick between #2 overall and #6 all won on Boxing Day. Seattle came into the weekend owning the #13 selection. Next week’s game with St. Louis will determine who wins the NFC West – meaning Seattle could either be picking in the top ten or no lower than 21st overall. As you know I like to run through different scenarios with my mocks and consider all possibilities. This week I went with something I haven’t done before – what if Seattle feels it has to draft a quarterback early? Watching this week’s heavy defeat in Tampa Bay will give few people confidence in Charlie Whitehurst as a starter. He’s contracted through 2011, but you fear for his future considering the salary he’s set to earn next year. Spending a third round pick and moving down in round two was a heavy price to pay for someone who might not succeed – but I still maintain it was a risk worth taking to try and answer the problem at QB. Unfortunately, it’s a problem that will still exist in the 2011 off season. Whitehurst has failed to impress in limited time on the field. The starter – Matt Hasselbeck – has not fared better with 17 interceptions and five lost fumbles. With his contract due to expire at the end of this season (and with Hasselbeck set to celebrate his 36th birthday next September) you have to believe the end is nigh. The Seahawks need to draft a quarterback, but it’s unrealistic to expect Hasselbeck to act as any kind of ‘mentor’ to a young QB. Ideally you don’t want to start a rookie in week one next year. However, re-signing Hasselbeck may be merely prolonging the inevitable and is there likely to be many options available on the free agent market who can play a holding role? What won’t be acceptable though, is to drift through another year with these same questions unanswered. This is a situation that should’ve been solved by the previous regime and wasn’t. Last year the options at quarterback were limited to one prospect – and he went first overall. In 2011, there may not be five Sam Bradford’s to choose from, but there are enough QB’s for the Seahawks to make sure they get one. That has to be the defining point of the entire off season. People can talk about the offensive line or cornerback (a position which in my opinion is a huge need). The Seahawks need a quarterback first and foremost – they need someone to invest their future in. In my latest mock Andrew Luck (#1, Carolina), Cam Newton (#3, Cincinnati) and Jake Locker (#9, Washington) all go in the top ten. I don’t project trades, but you would have to believe there’s some possibility the Seahawks would consider a move up the board if they truly believed in a guy like Locker (my article here explores why that may be the case). But what if they don’t want to trade up – or can’t? Blaine Gabbert (QB, Missouri) is someone who impressed me when I watched the Tigers take on Oklahoma (who were unbeaten at the time). It was a methodical, if not spectacular performance. Gabbert’s 308 yard, one touchdown performance matched the Sooner’s productive offense for a 36-27 win. He was accurate, fit the ball into some tight windows and showed consummate poise. The thing that immediately stands out are the physical qualities Gabbert has. He’s 6-5, 235lbs with a good arm. He’s able to get the ball out quickly with a nice release and he gets plenty of zip on his throws. He’s not immobile despite the size, but he’s not a factor as an athlete. There were a couple of really good throws in this game where he flashed the ability to drive the ball downfield into a tight window, splitting coverage for a nice gain. Overall his decision making was sound and there weren’t any bad mistakes. His release point isn’t a problem, he’s throws nicely off the front foot. He’s an accurate passer and a lot of his throws over the middle were on the money and made life easy for his receivers. There was a lot of underneath stuff and screens, but it didn’t dominate the game plan and show a restriction on his ability to make a big pass play. However, he also faced very little pressure from Oklahoma’s front four and had a lot of time in the gun to get the ball out. He comes from a spread system, working in the gun and he’s not going to walk in and be able to take snaps under center. He’ll need to work on that when he’s drafted, along with the usual stuff (pro-reads, footwork etc). The learning curve for rookies is substantial but for me slightly overplayed. Nearly every rookie with only a few exceptions will be learning how to improve their footwork, make more than a couple of reads and learn a substantially larger playbook. One of the knocks on Sam Bradford was the ultra-productive offense he played in and a lack of pressure when throwing. He also had a slight side-arm release point. Even so, you could see these issues were fixable. He was an accurate passer with generally could mechanics. Interview and research confirmed he was a dedicated and willing learner who would work hard to correct any problems. Physically Gabbert is a capable quarterback. Meetings will determine whether he’s likely to adapt to the pro’s and step up to the plate. I understand Gabbert is a vocal leader for his team who has shown talent off the field as a first-team academic All-Big 12 selection in 2009. On the whole his performances have been somewhat erratic in 2010 – which led most people to presume he would return for his senior season. He’s not the first QB to struggle against Nebraska’s defense (199 yards, one touchdown, one pick) but a 95-yard, 40% completion struggle against Texas Tech looks bad on paper. He ended the year with mediocre numbers against Kansas State, Iowa State and Kansas. Despite this, speculation persists that he’ll likely declare as a junior. The deadline for any decision is January 15th. On Tuesday he’ll face Iowa in the Insight Bowl. This will be interesting as he faces a solid defense and a good performance (and a victory) may increase the chances he declares. I gave him a round two grade when I watched him, based on a single performance but with potential to move into round one given his physical talents. Do not underestimate the power of a strong combine and pro-day – especially for quarterbacks with physical talents. Todd McShay (ESPN/Scouts Inc) ranks Gabbert as the #2 quarterback available in 2011 behind Andrew Luck. He’s ranked as the #20 overall prospect. If he can move his stock into round one, the Seahawks have to consider him if Luck, Newton and Locker are off the board. It may be a slight reach, but if the Seahawks like what they see in Gabbert – enough that he could be considered a legitimate long term starter – his value dwarfs any other position. It’s a tough decision to make, as in my latest mock Marcell Dareus (DT, Alabama) and Janoris Jenkins (CB, Florida) both remain on the board. I regard both as top-ten prospects who fill big needs for the Seahawks. But the Seahawks cannot afford to wait any longer for a quarterback even if that does mean a reach – albeit not a substantial one. Again – the issue isn’t to draft ‘any’ quarterback. However, you can’t afford to wait for the perfect prospect to land on your door. Josh Freeman – who scored five touchdowns against Seattle today – was far from the perfect prospect. Like Gabbert, he was a big QB with a strong arm and mobility. He was originally considered a border line R1/2 prospect but eventually settled as a round one lock. Can Gabbert emulate that? We’re a long way from finding out. Let’s not rule it out though. I need to watch more tape from this year, starting with the bowl game on the 28th December. Just briefly – some people may ask about Ryan Mallett – a prospect I am fond of but remains outside of round one. I would refer you to this article I wrote in November. I’ve updated the mock draft for Christmas Eve. Hope you all have a great holiday and let’s hope for a Seahawks win in Tampa Bay on Boxing day. There are some major changes to the mock draft so it’s worth checking out. Let me know what you think and I’ll have some thoughts/explanations on the blog soon. 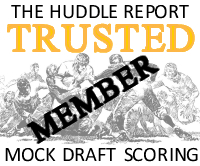 To see the latest projection click here or select MOCK DRAFT in the title bar. I’ll be watching the MAACO Bowl tonight between Boise State and Utah. I suspect it’ll be a very comfortable victory for the Broncos similar to the beating TCU put on the Utes earlier this season. One guy I’ve been asked about occasionally is Boise quarterback Kellen Moore. He’s from Washington so it’s not hard to see why there’s some interest in Seattle. He was a Heisman finalist this year and was second only to Cam Newton in quarterback rating in 2010. That said, he’s not a NFL quarterback. Moore is listed at around 5’11”-6’0″ depending on where you look. He’s approximately 185lbs and throws left handed. That alone is not a combination geared towards success in the NFL. His production should be admired as he’s done an excellent job to master the scheme he works in. Reports put this down to solid game intelligence, a strong work ethic and real dedication. That is all good for a solid college career and he’s reaped the rewards with wins and plaudits. It won’t be enough on it’s own in the NFL though. If you get a chance to watch the game tonight look at his throwing mechanics. You may notice how often he throws with a slingy side-arm release. That won’t cut it at the next level especially for a guy listed a shade under 6’0″ – he’ll have passes batted down or tipped on a regular basis. It also doesn’t help when trying to generate velocity on medium-to-deep routes – he generally has a weak arm, but the slingy action puts too much air on the ball and will encourage turnovers. Footwork is also another problem and Moore is a decidedly awkward runner in space. People like Tom Brady and Drew Brees often get quoted when discussing guys like Moore. They got by without the eye-catching physical attributes and had the smarts and work ethic to win Super Bowls. Let’s not forget they are very much the exception to the rule. For every Brees, there are a hundred QB’s like Moore that didn’t make it. It has to be said as well that Boise generally are a deep team and outclass a lot of their opponents. They have a strong defense and an under rated offensive line and receiver group. A sign of their dominance is shown by the fact Moore has only been sacked five times this year – the same number as Andrew Luck at Stanford. Greg McIlroy (30), Jake Locker (47), Cam Newton (21) and Ryan Mallett (21) have faced much greater pressure. It’s not completely negative, after all – there’s a reason he has the excellent numbers. The scheme plays its part – there’s a lot of underneath and short distance high percentage throws. The competition Moore faces is a lot weaker in the WAC than it would be against any of the top conferences. His game intelligence and ability to make quick judgements is a big plus point and whilst not owning elite accuracy, he’s certainly not inaccurate. However, I struggle to find any home for him in the NFL. At the moment I’d grade him as an undrafted free agent. He’s a junior and will almost certainly return for another season at Boise. He’ll complete his career a hero for his team, but his future will almost certainly not lie in the NFL. The Auburn quarterback was today voted the Associated Press’ player of the year. Newton had already won the Heisman, O’Brien and Maxwell awards. It’s another richly deserved honour for the best player in college football by an absolute mile. Ridiculously, the aforementioned Kellen Moore was named first-team All-American QB ahead of Newton. Let’s bring the whole thing into focus for a moment. Newton has single handed taken a likely 6-win team to an unbeaten season, the SEC title and now a National Championship. As a passer, he has the highest QB rating in the country (188.2). He completed 67% of his passes for 2589 yards, along with a 28-6 touchdown/interception ratio. Newton added 1409 rushing yards and 20 scores on the ground – making him the 10th best rusher in yardage and #2 behind LaMichael James for touchdowns. People wrongly assume he’s a run-first, gimmick quarterback who will struggle in the NFL. They are wrong. He’ll need to learn a much thicker and more complex playbook and move away from his two-read and run offense at Auburn. Indeed his ability to prove to GM’s and coaches he can be the ‘last guy out of the building’ type will essentially determine how high he goes. The sky’s the limit otherwise. Newton has better mechanics than most think – with a nice over the top release and strong arm. He needs to adjust his footwork and throw less from his back foot (he loses a lot of velocity), but he’s capable of some big-time NFL throws and he’s not inaccurate like some want you to believe. To put it bluntly there isn’t a quarterback in the NFL right now who you could compare Newton to. He’s original and a top-five pick in the making. He’s never been out of that range in any of my mocks – and I’ve included him a lot longer than most. Over rated or under rated? – Janoris Jenkins (CB, Florida): Only on Mel Kiper’s big board for the first time this week at #25. Not included in Rob Rang’s latest mock draft. – Julio Jones (WR, Alabama): Has made significant strides this season yet only considered a border-line first round pick by Todd McShay or Rob Rang. – Gabe Carimi (RT, Wisconsin): Came into the year a R2/3 prospect. Limited stock as a mere right tackle as not athletic enough for blind side, whiffs in space and struggles to stay low. – Justin Blackmon (WR, Oklahoma State): Won the Biletnikoff but suddenly a top-15 pick instead of the R2-3 grade I have. Not elite speed or hands. Good but not special. Right tackle in round one? I mentioned Rob Rang’s latest mock for CBS Sportsline. He had the Seahawks selecting 14th overall in his projection published yesterday (Seattle would actually own the 13th overall pick if the season ended today). I wouldn’t disagree about Locklear. The Seahawks re-worked his contract to make him a free agent in 2011, so his days may be numbered after a disappointing 2011. Chris Spencer is also a free agent but should be a priority signing after a solid year. Doubts remains at both guard spots and right tackle. Even so, the line has done better than most are willing to admit when it comes to pass protection. Run blocking has been less successful, but the Seahawks need to determine exactly what they want to do on the line. They started with Alex Gibbs, smaller lineman and the zone blocking scheme. Gibbs departed and bigger bodies were brought in. Is it a hybrid? Is it unclear and confused? Is it responsible for the issues in the run game? Has musical chairs on the line due to injury been an integral problem? What I would argue is – the Seahawks are not 7-9 because the offensive line has been the #1 issue. The team made a substantial investment when they drafted Russell Okung 6th overall last April. A solid offensive line is not dependant on first round picks. The Kansas City Chiefs are the #1 rushing offense in the NFL. On their roster they have one offensive lineman drafted in round one (by the previous regime) in Branden Albert. The rest are made up of four undrafted free agents, a third round pick, a fifth round pick and a selection in round six. Most of these prospects were not drafted by GM Scott Pioli in Kansas City, rather picked up in free agency or inherited. Creating a productive running game is about more than expensie draft picks. It’s also about health, consistency, familiarity and a defined scheme. The Seahawks have not suffered numerous blow-out defeats this year because of their right tackle. Seattle’s two quarterbacks have passed for 13 total touchdowns, but 20 total interceptions. The starter – Matt Hasselbeck – is ranked above only Brett Favre, Jimmy Clausen and Derek Anderson statistically. Is that due to the performance of Sean Locklear? It is obvious to me at least that investment at quarterback, the defensive line and cornerback (all premium positions) is of far more importance. Quite frankly I would be stunned if the Seahawks spent a top-15 pick on a right tackle. As mentioned above, I also think Carimi is being over rated in that range anyway. Not just in Rob Rang’s mock, but also many others (including this piece by ESPN’s Todd McShay) have placed Auburn defensive tacle Nick Fairley with teams using a 3-4 defensive scheme. Whilst I think Marcell Dareus (DT, Alabama) is versatile enough to play the five-technique (and make him an attractive option for Seattle), in my opinion Fairley is strictly a 4-3 three-technique. He’s at his best lined up in the middle using his quick burst off the snap and tremendous ability to dodge blocks and collapse the pocket. Playing at 5-tech will make a number of other demands that don’t suit his frame and perhaps detract from what he does best. You want to say to Fairley – “go get the quarterback”. You’re not going to want to ask him to hold his own at the point. It’ll limit Fairley’s stock if he is considered strictly a 4-3 prospect. Right now there are four 4-3 teams in the top-ten (Carolina, Cincinnati, Detroit and Houston). He’s unlikely to go #1 overall to the Panthers and I expect the Bengals to consider Da’Quan Bowers or – if available – Cam Newton. Detroit have Ndamukong Suh and need to invest in their secondary or with an extra edge rusher. That leaves Houston at #10 as perhaps his first likely destination. You can see why maybe he might not be the top-5 lock some are projecting. Here’s the updated 2011 NFL Draft order. I’ve posted the strength of schedule tie breaker next to each team’s record – this is determined by opponents’ win/loss record. When the percentage is the same, division and conference records determined order. If they are also equal then a coin toss takes place.